This Egyptian trio from Cairo are a bizarre bunch. With their debut album they take in a variety of styles such as folk and trippy rock, with a heavy slant on a variety of cultural leanings awash with Jazz sensibilities. There is a heavy amount of spazzed out guitar noodling along the way, which for the most part is quite enjoyable in an experimental sense; but can become irritating as over-indulgence sets in. Atmospherically speaking, there are momentary glances that did grab me, but these were too few and far between. ‘Bes’ is one of those albums that simply doesn’t float my boat, not because of any imperfections, but because it simply isn’t for me. The album feels heavily improvised (whether that is the case or not) and its jumbled nature doesn’t appeal to me on any level. This is not discounting the musicianship on display; it is clear that these guys have a high level of technical ability and they do have an audience that will lap this up. I applaud them for their competency and skill, but on an emotional level I need pits of darkness and shards of light; where this unfortunately loiters as a murky pea soup (and don’t get me started on their grammatically incorrect band name). 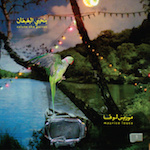 This is the second album from the Egyptian musician Maurice Louca, who has been making waves for some time in the Arabian alternative music scene; well revered over there for his complex percussion-based take on electronic and analogue structured subcultures. ‘The Golden Age’ opens up his latest album with a barrage of beats that take their cue from his ethnic roots, broken up in the same formulation as many a Post-Rock act would; then folded amongst a sea of eastern instrumentation. Occasionally flirting with Electronica and Breakcore inspired structures the next two tracks ‘Idiot’ and the title track further cement a high degree of compositional skills; with the latter touching on mainstream western culture, with an array of bitcrushed and transformed vocals that add a welcome alter-ego to the fray. ‘Salute the Parrot’ doesn’t sway from the path chosen; and whilst being a swell of coherent and impressive structuring, can be come a little too much to take in one listen alone, becoming all too overwhelming as time passes on. Proudly sticking to his roots as far as influences go, Louca deserves a pat on the back; however, for those not from that corner of the globe, this can feel a little isolating, where snake-charmed pipes are not engrained in the listeners upbringing. Overall though, this is a solid album that displays a high degree of knowledge and musicianship; and whilst not being something for everyone, is an interesting take on a multitude of genres, from an avenue of the planet I have not previously encountered.